Robert Turnbull has a longstanding relationship with SFEDI Awards and the IOEE and has a wealth of inspirational work in the field of enterprise and entrepreneurship under his belt. 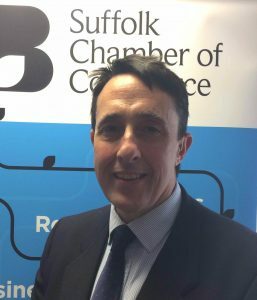 He is a SFEDI Awards Programme Leader for the Suffolk Chamber of Commerce, joining its Growth Hub in 2014 as a Business Growth Advisor, as well as a Fellow of the IOEE. Robert’s work helps businesses to grow and prosper, and its ethos for education and opportunity extends into the community, with the organisation delivering SFEDI Awards qualifications within prisons. This month we spoke with Robert to discuss the social and ethical impact of his work, his family inspiration, and taking an unconventional career path into enterprising success. Robert has always actively engaged with enterprise through his relationship with SFEDI Awards and the IOEE, dating back to 2009 when he worked for Business Link and undertook the SFEDI Broker Award. Today, Robert’s primary role is as a Business Growth Advisor, where he helps businesses in south Suffolk to embrace local and national business support, such as accessing grant schemes, training and developing staff, getting them the right advice to help them flourish. However, Robert tells us that his path into the field of enterprise was an unconventional one, with ups and downs, health challenges and redundancies, and a number of twists and turns along the way to get him to where he is today. Robert says: “It actually began with selling houses and being an estate agent – dare I say it! During this time I reengaged in education, funding myself through working full-time. I achieved a Master’s of Science in Strategic Marketing Management and in parallel I also trained to be a teacher and assessor through my PGCE – no mean feat with a newborn baby daughter. “I got into enterprise support – which ultimately led to my engagement with SFEDI Awards and the IOEE – through a peculiar pathway in the boom and bust of the housing market. I was unemployed quite a lot and so went on a training course to get a bit more benefit delivered by the local enterprise agency around planning your business, and I did such a good business plan that they asked me if I wanted to work for the enterprise agency, but this didn’t pan out as they lost funding. I then looked at who funded the course and it was the local Training and Enterprise Council, so I looked at their website and got a job managing work-based learning contracts, and this started my journey through delivering workforce development, Investors in People, Business Link and Skills Brokerage. “Fate took another hand and I wasn’t particularly well and couldn’t drive as I was still having seizures, but one of my old colleagues was now the New Anglia Growth Hub Manger and Suffolk Chamber approached me. He knew I wasn’t operating at my full capacity, but the Growth Hub and Suffolk Chamber supported me into work and to get back to better health and my cognitive norm, which was a difficult time. Robert has been a finalist for both the Enterprise Support Champion and the Enterprise Educator at the IOEE’s Celebrating Enterprise Awards at the House of Lords last year, and has worked closely with the enterprising bodies. Robert has had input into some of the enterprise frameworks for his apprenticeships at the request of Nic Preston, SFEDI’s Director of Quality, has given presentations at national Growth meetings alongside Ruth Lowbridge MBE, SFEDI’s Executive Chair, and has helped to organise the IOEE’s very first roadshow in the East of England, alongside IOEE Chief Executive, Sarah Trouten. “We ran our first pilot in partnership with MENTA, who delivered the training, and we assessed and managed quality and learner achievement. We achieved a 100% success rate, were awarded Direct Claims Status for this qualification, and have continued to achieve a 100% success rate, which has resulted in gaining ministerial mentions. “It is now likely that we will move onto Level 2 and look at other qualifications, like SFEDI Award’s new Passport to Enterprise and Employment, which has been recognised as good practice as part of the European Commission’s work around an EU-wide entrepreneurship skills framework. “There are always challenges and rewards, both personally and professionally, but the latter makes the former worth it. For a long time my health made things difficult, but it has progressively improved, my epilepsy is now in remission, and I’m moving forward. In my work I am inspired and motivated by seeing people’s courage, seeing them working to make something of themselves.